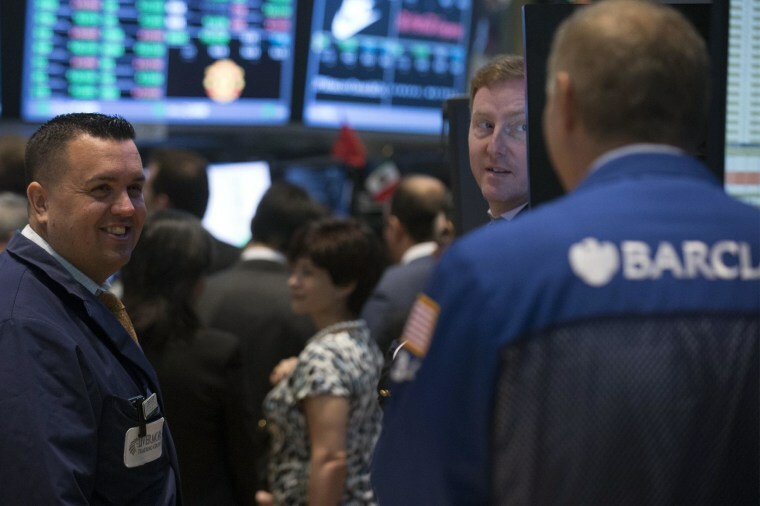 Stocks surged on Monday, lifting the S&P 500 and the Dow to record closing highs, as technology shares climbed and M&A activity helped brighten Wall Street's view of the economy. The Dow Jones Industrial Average ended unofficially 112 points higher at 16,695.47, eclipsing its previous record on Friday of 16,583.34. The S&P 500 also closed up 18 points, or nearly 1 percent, at 1,896.65, breaking its April 2 record close, with industrials and technology leading gains and utilities and telecommunications the poorest performers among its 10 major industry groups. The tech-heavy Nasdaq rose 72 points, or 1.7 percent. Internet and biotechnology shares battered last week bounced back on Monday, with Twitter, Yahoo and Facebook among those rallying. TripAdvisor, Netflix and Biogen Idec were among the top gainers on the S&P 500. Hillshire Brands said it would pay about $6.6 billion to purchase Pinnacle Foods, while the board of Allergan turned back an unsolicited offer from Valeant Pharmaceuticals International as significantly undervaluing the drug developer. And Pfizer pushed its proposal to buy AstraZeneca for $106 billion, with Pfizer's head of research saying the acquisition would not hinder drug research. "The earnings season has come along pretty good, and importantly, I think the guidance for the second quarter and the rest of the year has been constructive. So, with the weather out of the way, maybe there is a more positive read through on economic growth and corporate earnings, now that we have this winter issue behind us," said Phil Orlando, equity market strategist at Federated Investors. On the New York Mercantile Exchange, gold prices jumped $8.20, to $1,295.80 an ounce, and oil futures for June delivery climbed 60 cents, to $100.59 a barrel. The U.S. dollar fell against the currencies of major U.S. trading partners, while the 10-year Treasury yield used in figuring mortgage rates and other consumer loans added 3 basis points to 2.653 percent.